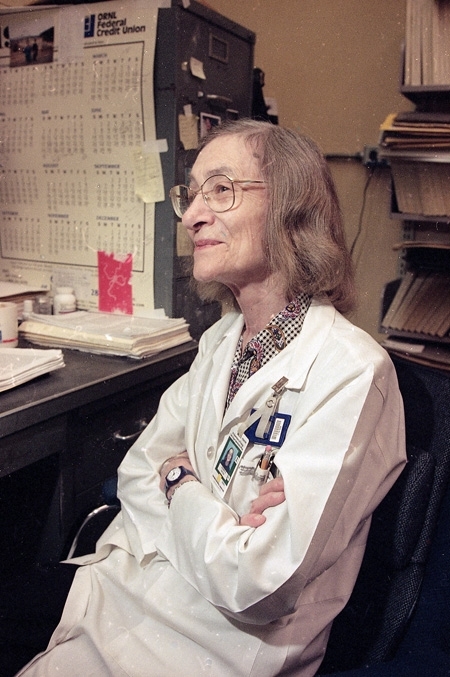 Audrey Stevens relaxes in her lab in 1998. Biochemist Audrey Stevens Niyogi, a member of the National Academy of Sciences and an important figure in U.S. science, has died at age 77. According to information provided by Oak Ridge National Laboratory, she died on Sunday, Feb. 28 at her home in Oak Ridge. A memorial visitation with family and friends will be held from 6 to 8 p.m. on Friday, March 5, at Weatherford Mortuary in Oak Ridge. Here is an article I wrote on her when she was elected to the academy in 1998. Audrey Stevens , a biochemist at Oak Ridge National Laboratory, is an important figure in U.S. science. That distinction was affirmed this spring by her election to the National Academy of Sciences. Stevens received congratulatory calls and cards from scientists around the globe, many of whom thought the honor was overdue, but she’s not that well known in the town where she lives and works. Even at the national laboratory, where Stevens has conducted biological research since 1966 — working with and discovering enzymes critical to the body’s genetic processing — she does not enjoy wide name recognition. The only news release in her file at ORNL’s public affairs office is one issued two weeks ago announcing her election to NAS. Perhaps, but Stevens ‘ career will not be defined by press clippings. She never sought celebrity, never marketed her research milestones, and she surely doesn’t equate fame with good work. Her priorities lie elsewhere. Although she received a personal invitation to attend that speech, a chance to bask in applause from her Oak Ridge colleagues, Stevens couldn’t make it. She was in the middle of an experiment in her lab, where she almost always works alone. Her research takes precedence over almost everything. “What drives her is a sheer quest for knowledge — not fame, not glory, not money, not self-aggrandizement. She has an insatiable thirst for knowledge,” said Fred Hartman, research group leader and former director of the Biology Division. Hartman came to ORNL the same year as Stevens , and he appreciates what she has done. “It’s extraordinary if you consider the rather meager support she has received over the years,” he said. “Ninety-nine percent of what she has accomplished has come with her own two hands and working extraordinarily long hours. She is extremely dedicated, motivated, extremely intelligent. She asks the right question at the right time and shows enormous perseverance. To learn about Stevens , one has to talk to friends, family and colleagues. She’s too modest to share much about herself, except to provide the background basics and to describe the technical aspects of her work. Stevens grew up on a Nebraska corn farm, where she milked cows and apparently learned the value of hard work. Her interest in science came from an older brother. “He went into chemistry and then organic chemistry. It was he, it was in his footsteps, that I was following,” she said. Stevens didn’t have a lot of female role models while choosing biochemistry as a career path in the 1950s. She was only the second woman graduate student at Case Western University, earning her doctorate degree there in 1958. Stevens ‘ research spans four decades, and one of her major discoveries — the bacterial RNA (ribonucleic acid) polymerase, an enzyme that copies a cell’s genetic signature — came even before she arrived in Oak Ridge. Since then, the scientist has done much work with the biological processes associated with the body’s manufacture of proteins. For nearly 20 years she has focused her studies on various aspects of messenger RNA, whose actions transport the DNA sequence and contribute to gene regulation in cells. These enzymes degrade and regenerate over minutes, hours or days in a constantly changing process that affects cell growth. Aberrations in this complex growth system may signal the onset of cancer. Stevens ‘ research has broad applications to other research programs, including studies of disease. As is often the case with basic research, potentially useful information arrives unexpectedly. According to Hartman, Stevens discovered during recent lab experiments that lithium is a potential inhibitor of one of the enzymes that degrades messenger RNA. This observation could be of help to others trying to understand the efficacy of lithium, a chemical commonly used to treat mental illness because it alleviates some symptoms. If that can be understood, then maybe it also will help researchers exploring the mechanics of mental illness. Stevens is quiet, modest to an extreme, perhaps even meek, but those close to her insist she isn’t shy — another adjective often used to describe the 65-year-old scientist. Stevens works in her lab seven days a week, usually arriving before 6 a.m. On Saturdays and Sundays, she takes the afternoon off. When she arrives home, Stevens often reviews research results and does calculations up until dinner and afterwards plans the next day’s experiments, said Salil Niyogi , her husband who’s also a researcher at ORNL, working in a lab next to hers. Niyogi met Stevens in 1962 at St. Louis University, where she was a young faculty member and he was a visiting scientist. They got married two years later in Maryland, the next stop on the post-doctoral tour, where she was at the University of Maryland School of Medicine and he at Johns Hopkins. According to Niyogi , a native of India, the road to success hasn’t always been easy, for either of them. “Women and foreigners are about in the same boat,” he said. Niyogi said his wife still regularly reminds their two successful sons — one a microbiologist on the faculty at the University of California-Berkeley, the other finishing his doctorate in environmental sciences at the University of Colorado — to work hard. During ORNL’s half-century of operations, only eight scientists (including Stevens ) have been elected to the National Academy of Sciences while working at the Oak Ridge laboratory. Only three current staff members are in the academy. What makes Stevens ‘ selection all the more remarkable is that she’s done little networking within the scientific establishment. She hasn’t served on committees and editorial boards or performed other activities — aside from authoring and peer-reviewing research papers — that get one’s name known among the academy’s voting membership. She purposely avoids the limelight, according to her husband. “I’m not the first one to seek out a party,” Stevens said, acknowledging that some may consider her anti-social. Many years ago, when her boys were young, Stevens oftentimes would retreat to a corner at Oak Ridge gatherings and talk about the children with other mothers. “They didn’t know for a long time that she was a scientist of some repute,” Niyogi said. It seems like Stevens was a Super Mom before that modern-day term became cool. After their second son was born in 1967, she felt the kids needed more of her attention. So she dropped her work status to a half-time position for 17 years. Only she never really worked half-time, giving the laboratory’s research sponsors many bonus hours. By the time she was ready to resume her career full-time, funding was tighter within the Department of Energy’s biological programs, and it was a struggle for her to reclaim the research position. Stevens worked harder than ever on her scientific experiments, usually competing against research teams with much greater resources. She prepared her own chemical solutions and completed most tasks without assistance, but she produced results that commanded attention. Although it’s unusual for a scientist of her stature to work without technicians, Stevens said it hasn’t necessarily been a negative. The irony of Stevens ‘ election to the National Academy of Sciences — an honor some consider second only to the Nobel Prize — is that it comes just a few months after she and other members of the lab’s protein engineering and enzymology research group were told they were losing their federal funding base in fiscal 1999. While acknowledging the situation and answering direct questions, Stevens prefers not to dwell on it. Nor do other researchers in the group, apparently afraid they’ll look like whiners. Indeed, there are reports that lab officials are trying get some funds reinstated at DOE headquarters in Washington or possibly tap into other sources. Stevens is philosophical about this late-career dilemma. She and her husband could latch onto guest research positions elsewhere. Or they’re equipped to retire. The latter option, however, seems unlikely. “I would like to continue my research,” she said. The announcement of her election to the academy lifted morale in the research group at a time when it was most needed. The good news came at 10 a.m., Tuesday, April 28, in a telephone call from Sankar Adhya, a friend and research colleague at the National Institutes of Health, who pushed Stevens ‘ nomination before the academy. Oddly enough, Stevens was at home at the time. Her elder son and his wife were visiting, and family members were enjoying a late breakfast when the phone rang. “I didn’t know what to say,” she said. Niyogi , who had been downstairs in the garage fixing a water leak, came into the kitchen while his wife was still on the phone with Adhya. “She was sitting there with almost a dazed look on her face,” he said. That daze soon turned to a smile, and the celebration began. Champagne joined the breakfast table. A little later, the researchers went — where else? — to the laboratory to share the news with others. Weeks have passed, but Niyogi still gets a little choked up when he talks about the belated recognition his wife is receiving for a lifetime of inspired research. “The meek, they say, will inherit the earth, and once in a while they do,” he said. This entry was posted in ORNL on March 4, 2010 by Frank Munger. Thank you for reprinting this article Frank. I had never seen it before and it is a very nice testament to her and her science. Im afraid I cant say I knew her well, but as a friend of one her amazing sons Dev and as a professional admirer of her science achievements, I can tell you she will be missed! I agree. Thank you for reprinting. I remember her as Kris’ mom. I only learned of her scientific achievements a few years ago. She had to be an amazing woman – pioneering researcher, while at the same time wife & mother.